What creature on earth has the longest neck? What creature will regenerate another head when the original one is cut off? What creature can extend its neck over 7x its body length? What creature feeds by ripping giant chunks out of other animals? What creature exists invisible to the human eye? its name is Lacrymaria olor - (Latin for 'Tear of a Swan')! 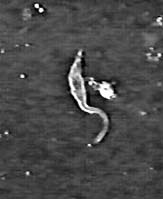 One of the most unusual microscopic animals amongst the wide range of protozoans is Lacrymaria olor, a very small creature - typically 100 microns long, that lives in freshwater ponds. Its name means 'tear of a swan', which is an excellent and apt description of both its general shape, and one of its identifying traits; for this animal possess the ability to extend its head outwards by means of what looks like an elongating neck. 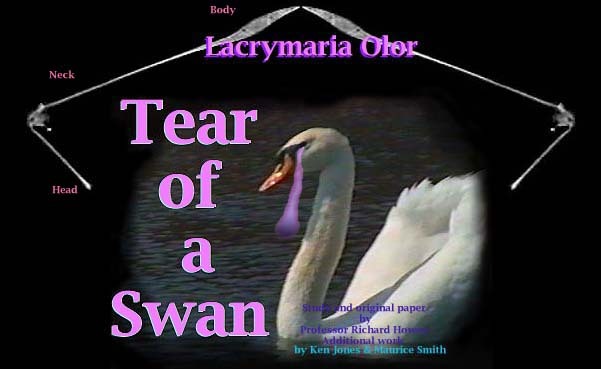 And just as a swan is able to manipulate its neck in many directions, Lacrymaria is able to maintain the same type of agility over its extensibility. The following notes on this curious creature have been drawn from a fabulous and detailed study by Professor Richard L. Howey, of Laramie, Wyoming, (see portrait left) and is accompanied by images captured on video by Ken Jones, a UK amateur microscopist - renowned for his high quality video films of microscopic forms. Further references have been drawn from a newsletter of the Manchester Microscopical & Natural History Society, edited by Roy Winsby as an extraction from Professor Howey's original paper and study. Lacrymaria, although often mentioned in early books and papers on protozoa, seems to have been little studied prior to the 20th century. An early reference appears in a wonderful little publication called Evenings at the Microscope, published by the Society for promoting Christian Knowledge, London, 1859 - yet most of the article, whilst providing an accurate and detailed observation of the creature and its movements, gives little detail of its lifestyle and morphology. The amateur microscopist's pond-life bible 'Fresh-water Biology' (Ward & Whipple), places the representative species to Müller 1786. Often described as having two macronuclei and a single micronucleus, Professor Howey reports observing specimens with one, two, three, four, five, and seven macronuclei, "...although special reasons apply for those having more than two". The body is covered with cilia, arranged in spirals down the neck and along the body, providing a means of locomotion. 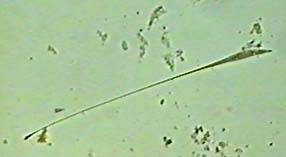 Cilia around the head appear longer and are in bundles. The 'neck' itself is difficult to understand in terms of its structure, but Professor Howey speculates that it probably consists of microtubules and possibly myonemes. Lacrymaria olor has two contractile vacuoles to regulate the osmotic pressure in the cell. One of these is typically located in the posterior end of the cell, with the other at the anterior end of the body near the beginning of the neck. Both the body and neck usually contain crystals which show up strikingly under polarized light; they are especially concentrated at the posterior end of the cell. "I found five specimens in a culture sample which I collected from Hutton Lake in the game preserve located about 15 miles south-west of Laramie. On earlier occasions, I had found a few specimens and both Bob Jenkins and I attempted to culture the organism with no success. However, this time, I was determined to establish cultures. Beginning with these five cells, I coaxed them along, making hundreds of cultures and trying dozens of different types of culture media. This process was both tedious and aromatic as my long-suffering wife will attest. I tried making extracts of hay, wheat, cow dung, malted milk, alfalfa, lettuce, sheep dung, rice, and all kinds of combinations. Finally after a long period of trial and error combined with consultation of literature on various types of media used for culturing protozoa, I found a medium that has provided moderate success. Mating types can change or be lost according to the time of day (Barnett, 1966). During the day, one clone will be of mating type 1 and will mate only with mating type 2. At dusk, members of the clone will not mate at all. By nightfall, the mating type 1s will have changed into 2s and will thus refuse to mate with other mating type 2s. By changing the lighting conditions, making 'dawn' and 'dusk' come at different times, the formation of different sexes or mating types in these paramecia can then be controlled. Mating type is determined by the presence of proteins on the surface of the cilia. (Margulis, p.200). Now, if there is no other mating type available, then Lacrymaria may simply start dividing up its own genetic material into six, eight, or more pieces and begin a process of repair and recombination. The mechanism is called autogamy. After this reorganization, the organism can then begin to reproduce again by division. Certain conditions obtain for autogamy to take place and the cells must still be healthy enough to undergo this radical repair process. If the conditions are not right, then the organism will reach a limit in terms of the number of times it can divide, and the culture will die out. What is intriguing is that there is apparently a genetic switch operative here. It functions rather like a counter and keeps track of the number of divisions. If there has been no new genetic material introduced by conjugation nor any reorganization of the genetic material by means of autogamy, then when the counter reaches its programmed limits, the cells die off. Now, I was not looking for any such phenomenon when I started too culture Lacrymaria. However on three occasions, I had all of my cultures die off within a period of about two weeks, and on each occasion that involved 50 cultures. In the old cultures, there was no indication of viral infection, chemical contamination, or predation. This led me to the suspicion that Lacrymaria might have a 'genetic switch' such as the one which has been described for Paramecium. I spent a summer collecting Lacrymaria from lakes, rivers, ponds , streams, springs, and puddles. By collecting specimens from a variety of locations, I was hoping to obtain Lacrymaria with slightly different genetic variations to provide different mating types. I found specimens in six distinctly different environments and cultured all of them. They flourished at first. However, after some months two strains started to get smaller and smaller, a clear sign of weakening. Four strains still survive along with several mixes. The crossing of the different strains sometimes produces a new hardier strain, but not always. In short, the other three people who failed to have success with my culture method may have run into a problem with a 'genetic switch' as a result of insufficient genetic diversity." Some microscopic life-forms are able to go through reorganization of their cell structure to produce one or more protective 'casings' and go dormant: a process called encystment! This allows the organism to survive dehydration, heat, cold, oxygen loss, and some kinds of contamination. It is a complex and remarkable process, where years later, under the return of favourable conditions - the organism can reform itself and emerge from the cyst to take up life from where it left off: a kind of resurrection! Professor Howey reports that he was able to get experimental evidence for encystment and excystment in Lacrymaria by letting the culture dry out completely, and then - after several months - adding new culture medium. In several cases, the 'resurrection' process was observed. Lacrymaria seem to go into a resting stage and sometimes into a cyst which is extraordinarily small and therefore almost impossible to trace. Lacrymaria feed primarily on small ciliates, flagellates, and amoeba, although on occasion they will tear chunks out of larger ciliates for food. The feeding process appears a random process with the animal locating food by contacting a suitable supply with its "nose cone". Professor Howey reports that observing the feeding process can be very frustrating, with the Lacrymaria seemingly not well-equipped to identify its food consistently. This trait certainly seems to be true when I observed the video footage taken by Ken Jones. One of the most incredible observations in Professor Howey's paper was that the Lacrymaria was able to regenerate a new head when the original one was cut off. The professor ingeniously drew a home-made microscalpel across the neck of a specimen, to discover that the head zipped away from the body like a small powerful motor, whilst the wounded neck sealed off almost immediately. Within minutes, regeneration had begun, resulting in the growth of a new head in a very short time; alas, the original head enjoyed a brief period of rapid swimming (minutes) before ceasing motion and disintegrating. You may wish to visit the Micscape Movie Section to see a longer video of Lacrymaria olor in far smoother detail. All material is (c) copyright of Professor Howey, Ken Jones, or Micscape. Please don't use it without asking first! If in doubt, check it out: we don't bite! Notes: this article is a very summary one based on a far more detailed study by Professor Howey. 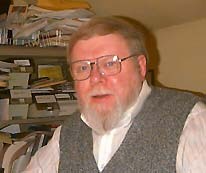 The video footage was provided by Ken Jones and was vastly superior to the somewhat poorer quality replications shown in association with this article. This is due to keeping file size down for web transmissions. All material remains the copyright of the contributors. We have been able to contact Professor Howey... who kindly consented to us reproducing his study and observations here for you to share. His original work has been edited slightly to optimise it for web retention. Micscape thanks you greatly Professor, for this wonderful contribution. Please contact me, Maurice Smith, if anyone else can add further information about Lacrymaria olor. Many thanks to Ken Jones, Roy Winsby, and Prof. Richard L. Howey for their excellent personal and original work, and their even greater commitment to the study of microscopic life!